Powerful Payment Tools At your fingertips! Everything you need to manage your credit repair payments is included! No matter how you collect credit repair payments, either by phone, in person, or through the internet, you will have an easy to use virtual terminal to quickly process the transaction through any web-enabled device. There is no software to install or keep updated. Our gateway is fully customizable, so it can be tailored to your specific needs. 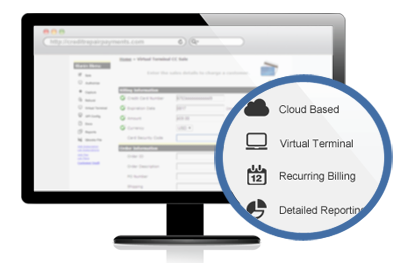 Our gateway allows you to bill customers on a recurring basis without having to re-enter the check data. Have multiple price points? Set up different plans, add or remove customers as needed, and set the recurring timeframe. Unlike most processors, this is available to our customers at no additional cost. No matter how you collect credit repair payments, either by phone, in person, or through the internet, you will have an easy to use virtual terminal to quickly process the transaction through any web-enabled device. There is no software to install or keep updated. Your merchant account will work with all of the leading dispute management software packages. CMS has been recognized as a leader in credit repair payments among the major industry players, and you will enjoy a seamless integration experience by using us to process credit card transactions. Supports batch uploading of Excel and .CSV files for easy processing. Uploading batch files is simple via the web interface or through FTP. Flexibility to create and assign up to 100 different users within your company. Access can be customized using 17 different settings, depending on each user’s needs. Make accounting easier by importing your transaction data into your Quickbooks by Intuit software. Data can be saved as an .IIF file for maximum compatibility. Need shopping cart integration? We have you covered. Provide a seamless experience for your customer when accepting credit repair payments. Our API is easy to implement, user friendly, and is available upon request.